Suitable for most project management scenarios, except perhaps for Scrum. Not as detailed as MS Project.Suitable for tracking multiple orgs and vendors, with billable and non-billable time tracking options.Not suitable for granular resource tracking or in-app reporting of multiple data points/axis. Sets up tasks and sub tasks easily and natively, without having to learn a new workflow or incorporate different natural processes into our every day. Allows easy delegation of responsibilities to keep everyone on task. Managing task interdependencies is more difficult than it should be. Because of the above, using Teamwork to plan and preview project timelines in a flexible way is very difficult. We are already at an annual contract, and have been for the past 5 years; so far the system has delivered, and our personal is already trained in it. A major overhaul of our entire infrastructure (as in moving everything to a single, unified platform) might change the current continuity of Teamwork Projects on our organization, but that's not feasible in the near future. 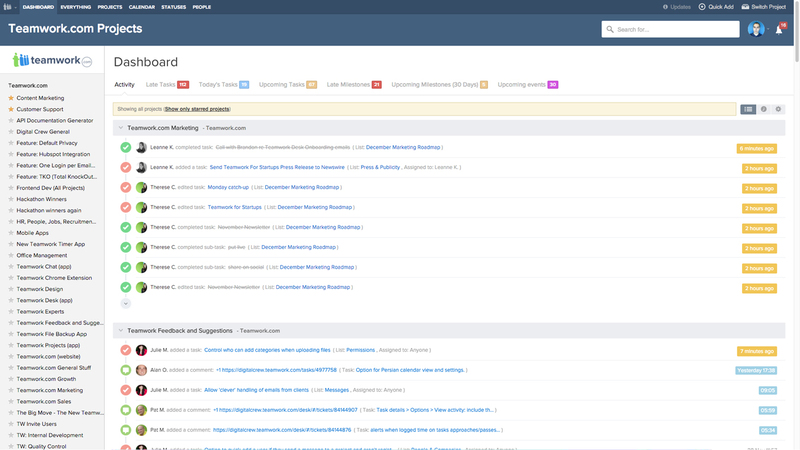 Teamwork has not only a Kanban view and Gantt chart view, but it also shows a calendar view, board view, and list view. It's very comprehensive and gives its users freedom to customize the viewing experience where several other competitor platforms only show one or two views. POSITIVE: A faster TTM on projects. POSITIVE: A better and more accurate resource usage control, especially on service projects. POSITIVE: A more centralized hub for project managers and their peers.